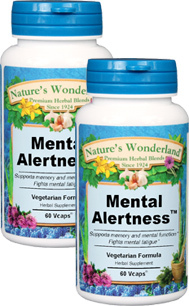 Mental Alertness™ - 450 mg, 60 Vcaps™ each (Nature's Wonderland) - Penn Herb Co. Ltd. Mental Alertness™ is a brain-stimulating herbal formula that helps restore mental alertness when experiencing mental fatigue, absentmindedness and mild memory problems associated with aging. GOTU KOLA…Ayurvedic "brain food" improves learning ability and mental recall. Keep Your Memory Strong and Your Mind Sharp with Mental Alertness™ herbal blend! As an addition to the daily diet, take 1 or 2 capsules three times daily with water at mealtimes.